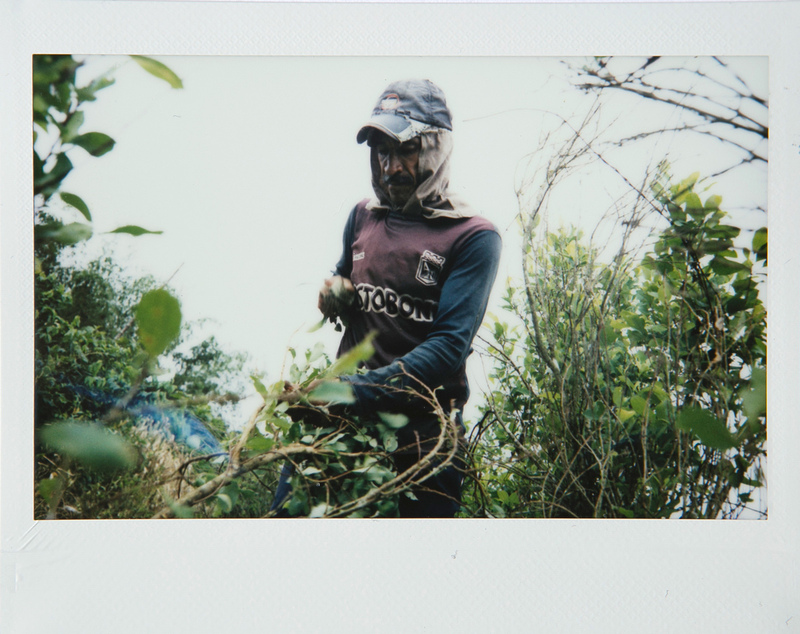 Instant Photos From Colombia's Coca Heartland : The Picture Show A Venezuelan photographer travels to a Colombian coca-growing region and uses instant photography and drawings to portray a country in limbo. Ariel Ramos, 50, is tearing out coca leaves to be processed into coca paste, a substance that can be smoked or used for making cocaine powder. "I don't need to move to sell coca paste, the buyers come to me. It is easier than planting anything else." 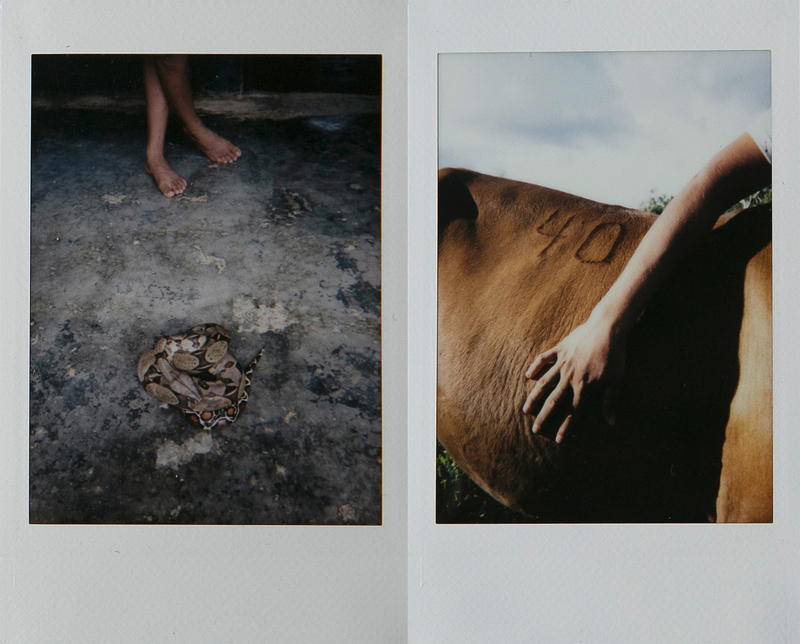 When Venezuelan photographer Fabiola Ferrero first traveled to the city of Florencia in Colombia, she took two instant cameras with her. Her goal: to portray a country in limbo between war and peace. In 2016, the Colombian government and rebels from the country's largest guerrilla group signed an agreement to end half a century of war. Though a clear path to sustainable peace is still to come. 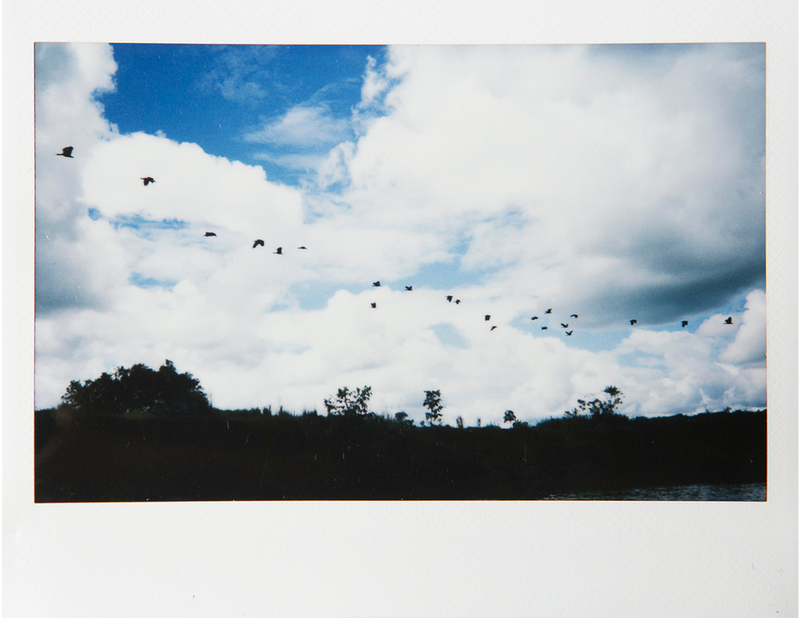 Birds fly over a river in Caquetá, Colombia. Ferrero traveled to Florencia, in southwestern Colombia's Caquetá department, in April 2017. Caquetá has been a key location for producing coca, the crop used for making cocaine, and has been hit hard by conflict. She stayed with a coca-growing family for a week. 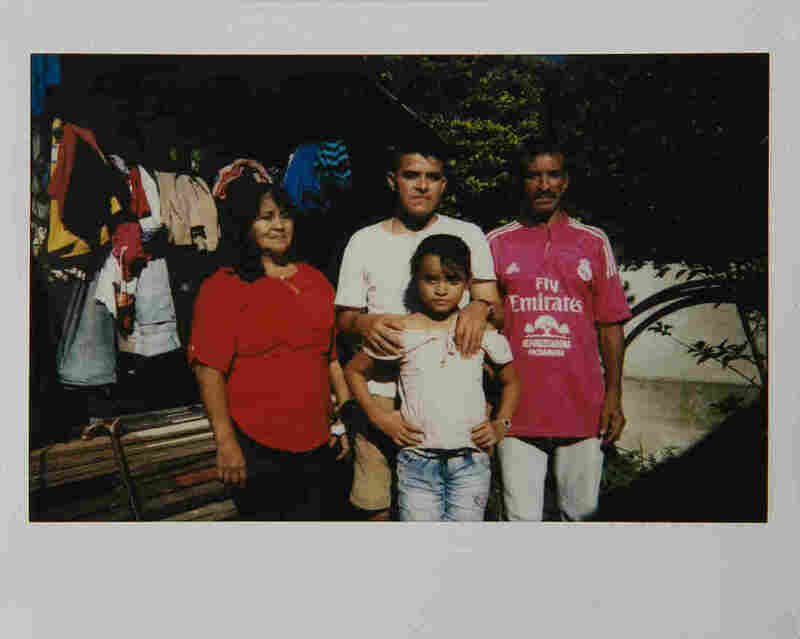 Ariel Ramos and his family pose for a portrait outside their home in Zabaleta, Colombia. Ferrero established a connection with the head of the family, a raspachín or coca farmer, and with his family. She asked them to visually convey — with paper and markers — what life is like and their idea of peace. 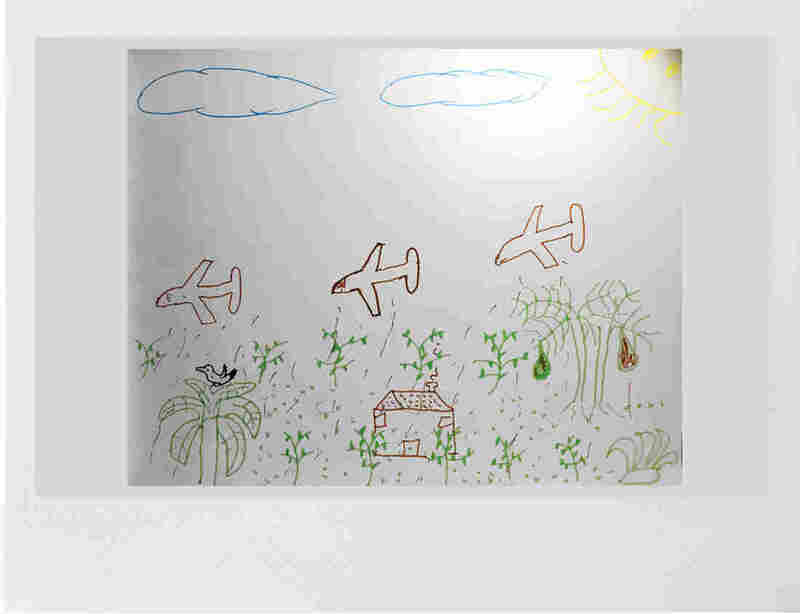 A drawing made by a coca farmer shows his memory of government airplanes destroying his fields in 2005 as part of Plan Colombia, a U.S.-funded program to counter drug trafficking and insurgency. What resulted was a collaborative mixed-media project exploring the daily life of families that depend solely on income from growing coca. The project also touches on issues related to climate change and mental health in times of conflict. 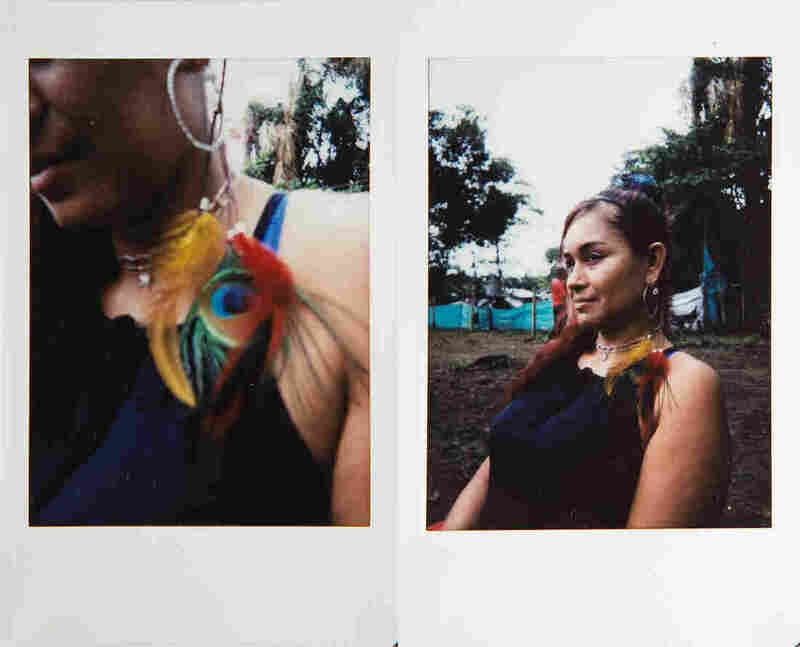 Ferrero used two Fujifilm Instax cameras, an instant photography format that provides a sense of immediacy and the direct involvement of her subjects. They could interact, talk about their experiences, informally be photographed and keep the Polaroids for themselves. For a community that struggles with issues of justice, seeing and keeping the results of the interaction with Ferrero was meaningful. 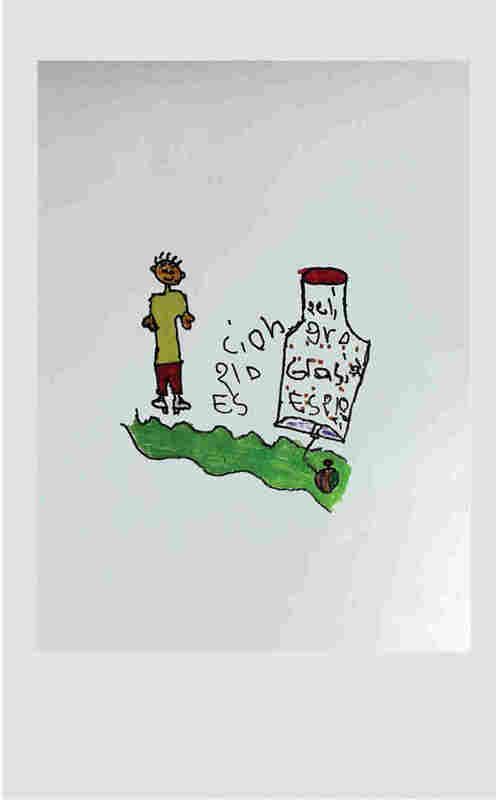 The work that we see is a juxtaposition of the drawings made by the local families and a digitized version of her instant imagery, creating a mixed narrative and a visceral approach to visual storytelling. The work is not only aesthetically on point, but it also provides a direct connection with the characters in her story. They are the co-narrators of the story, and their point of view is as important as Ferrero's. An ex-member of the Revolutionary Armed Forces of Colombia, a leftist rebel group, poses for a portrait in Zabaleta. NPR caught up with Ferrero recently for a conversation about her work. The following are edited excerpts from the interview. 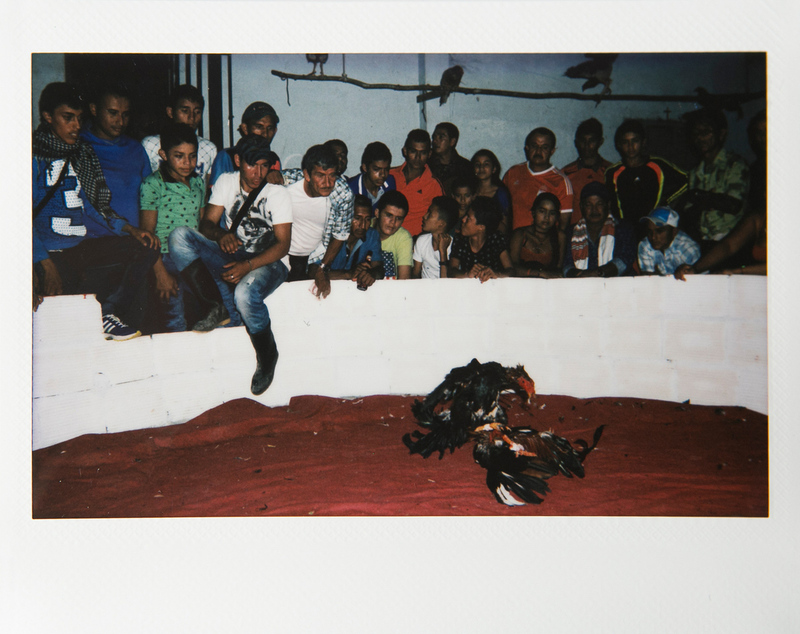 Instant photography is such a different approach to documentary storytelling. Why did you choose it for this work? My idea was to photograph a short period of time, the days between a nation in conflict and a nation in peace. 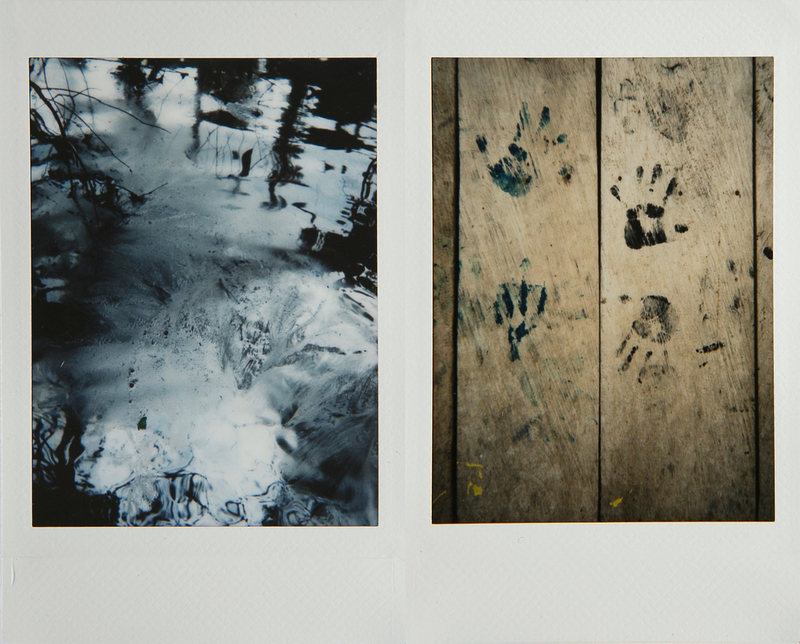 So the instant cameras contribute to the concept of a moment that will only exist briefly. I visited these areas right after the peace agreement was signed. The incomes of the Zabaleta community are based on coca plants. Almost all the families depend on this, and they were being asked to replace their crops but didn't have any reliable option to sustain their children. So, mixing the instant images taken by me and the drawings about their hopes and fears made by them was a way to portray a mental state of uncertainty, of limbo. Left: A girl stands in front of a snake found in her house in Zabaleta. Families live surrounded by snakes, rats and all types of insects. Right: A man touches one of his horses outside his home by the Zabaleta River. How was your approach and collaboration with the families and people you worked with in Colombia? I lived with the family of one raspachín [coca harvester] for a week. I brought the instant cameras and a notebook for them to draw. Then I just talked to a lot of members of the community, and based on those interviews, I asked them if they wanted to visually explain something related either to the conflict they lived through or the peace they hoped for. Men watch a cockfight on a Friday night in Zabaleta. I also made portraits with the instant cameras for them to keep, and I would love to come back someday, when peace is finally a reality, and see those portraits in their houses. This was made less than a year after the peace agreement was signed, and the amount of coca crops was at its highest point in decades. So, the mood was of both celebration and skepticism. I wanted to pay attention to coca farmers because the increase of coca crops was seen as the biggest threat to peace: Where there are drugs, there is usually violence. The farmers I met chose this path because it is paid better than other plantations. [Coca] is not as heavy as potatoes or corn, for instance, which would cost them money to transport, and they don't even need to transport anything, because secret buyers come to them personally and pick up the crop. They were also promised financial help to substitute their crops, but at that moment hadn't received it. These campesinos are not growing rich, quite the opposite: They barely have water access, for instance. It doesn't seem like it is a problem with a sustainable short-term solution. It involves deep structural reasons behind it. 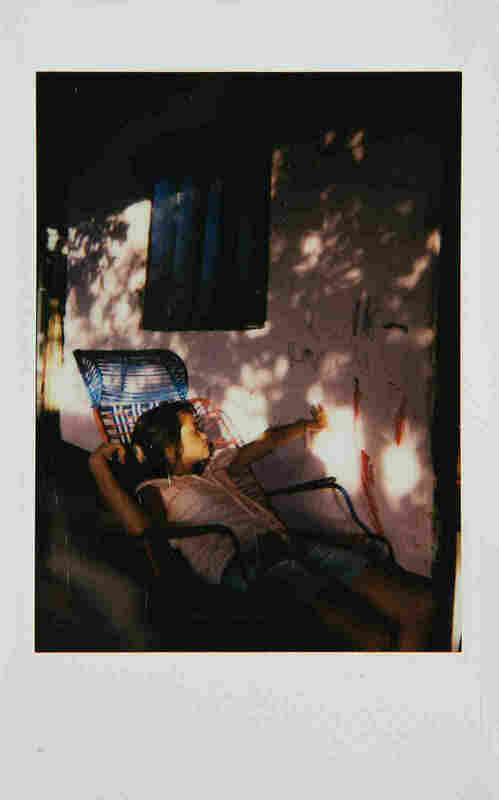 Anyelis, age 7, plays with the light outside of her home. How was their reaction? Was this a sort of reflective exercise whereby people could talk and narrate their experiences before, during and after the peace process? Drawings were made individually; it wasn't a group exercise. They were very open to share their experiences, and my role was journalistic. I also visited a zona veredal of former FARC members [a normalization zone for ex-members of the rebel group, the Revolutionary Armed Forces of Colombia]. But the issue is more complex and a deeper insight was necessary, so I wrote quite an extensive article for a Colombian magazine. I actually studied investigative journalism (not photography), and I write a lot on my projects. Left: Oil pollution in the rivers and lagoons of the Nariño region. The indigenous group Awá says people have been smuggling oil out of the area. Right: Children's painted hand prints on an indigenous house in Nariño. Did your notions of war and war in Colombia in particular change after this project? How did it affect you as a visual storyteller and photographer? I always have the feeling that, no matter what I do, the work seems incomplete, because I am not the one experiencing their story, but I am the one who is telling it. This is not the conflict I grew up in, although now my family is based in Colombia and I travel back and forth between Venezuela and Colombia. So, in order to have the story narrated by the people, I asked them to draw. A drawing made by Anyelis, 7, of a man standing next to a land mine. "This is what we are taught at school," she says. For instance: Anyelis asked me if she could draw a land mine as soon as she saw the colors. She's a 7-year-old girl, and the daughter of the man who was hosting me. The conflict in Colombia has left more than 220,000 victims dead, but it involves more than those reached by a bullet, because it relates to how people change their perception of reality and their behaviors. It is the human adapting to horror in order to survive. Anyelis knows how to draw a land mine and what to do if she sees one, because they teach them that at school: It is tragedy becoming normal. The land mine on the paper was bigger than the man she drew next to it, and I don't think I can explain better than her that she knows this at 7 and I don't. This was the first time I asked people to be part of the creative process, and since then I try to find ways to do it. I am currently working on a project with Magnum Foundation related to Venezuela's collapse and its diaspora, and it is based on collaborations. How did it affect you as a Latin American? Not so much affect, but teach. As a Venezuelan, I was coming to Colombia right after the protests started in [Venezuela's capital] Caracas in 2017. So I came with violent images in my head to a country that was very hopeful. Caracas was tear gas and people expressing anger, [the Colombian department of] Caquetá was dreaming of something better, although uncertain. To me, Colombia and Venezuela share something tragic, which is the experience of violence for long periods of time. In Venezuela we have one of the highest crime rates in the world, but the country next to us has had over five decades of armed conflict. And, by the way, our country has also been affected by it: A recent report says that ELN, the National Liberation Army, a leftist rebel group, is currently acting inside a large proportion of Venezuelan territory. So, this conflict, although reduced, should still matter, because violence is very much present in the rural areas, where 230 social leaders have been killed this year. There are still so many things changing in Colombia, and so many things to be told. 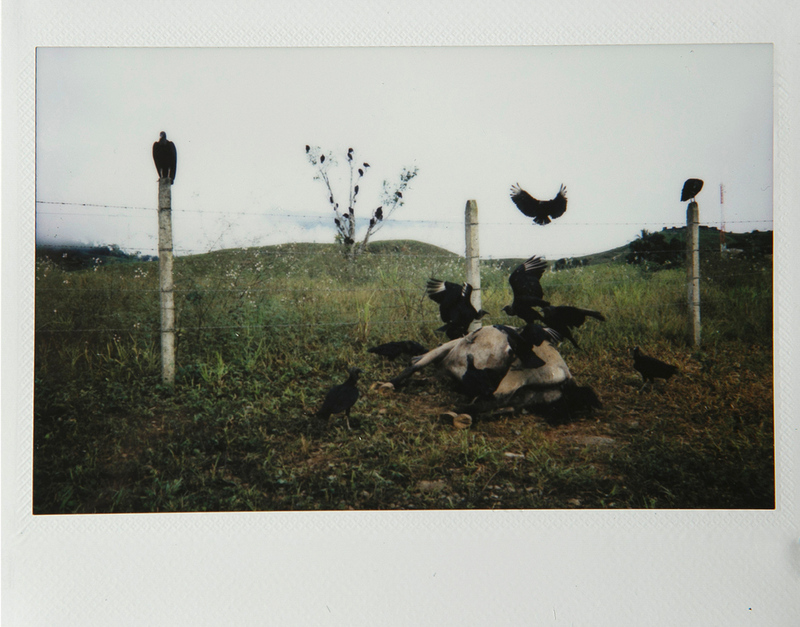 A horse cadaver is eaten by vultures near Zabaleta. That people care more about Latin America. We have the new Brazilian president, the climate fight led by indigenous groups in the whole region, the increase of coca crops, the crisis in Venezuela and how it is moving to neighboring countries, the migration and violence in Central America. This all affects people beyond our borders, it is important and we should follow up on these stories. Left: The hand of a raspachín, a worker who collects the leaves of coca plants. 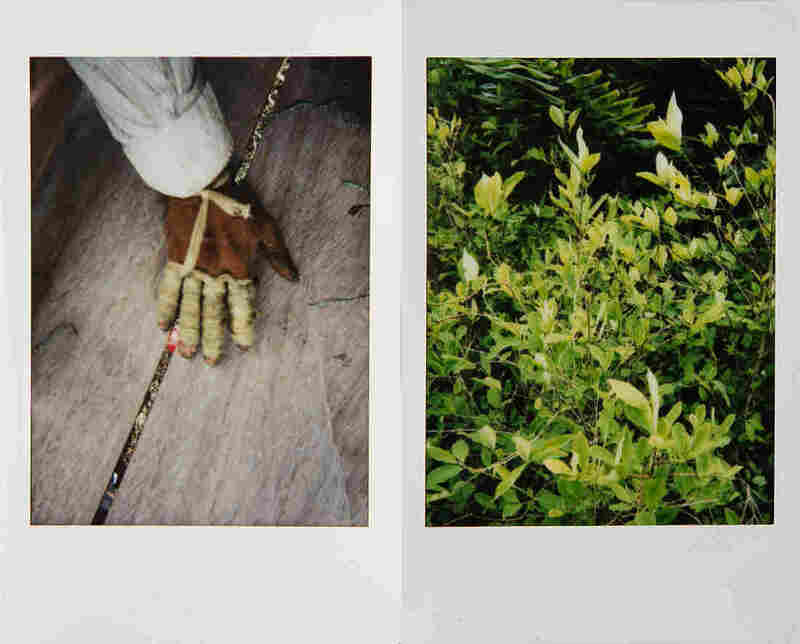 Right: Coca plants in Nariño.